This may come as a surprise to some, but not everyone loves salt chlorine generators. Each pool owner has their reasons for not liking salt pools. Some people experience rusting, others have softstone decks, or just don’t like plunking down a few hundred dollars for a replacement cell. No matter what the reason is, these pool owners want the easiest way of converting their pool from saltwater to traditional chlorine, a.k.a. freshwater. Do I have to drain my pool? Not entirely, but you will be draining a portion of your pool’s water that will be replaced with fresh water to lower the cyanuric acid (CYA) levels. The chemical CYA is sometimes referred to as stabilizer. Chlorine created by salt generators is a pure form, meaning salt pools require of you to add CYA to protect the chlorine. A salt pool’s CYA levels hover around 80-90 parts per million (ppm), whereas chlorine pools should be about half that at 40 ppm. CYA, unlike chlorine, does not dissipate from pool water. So, to lower your CYA, you must drain a portion of your pool and then refill with fresh water. A good method of draining is the percentage method. If your CYA level is 80 ppm and you want it at 40 ppm, drain about 50 percent of your water. For you folks in areas with high water tables, like us Floridians, be mindful of when you drain the pool. Do not drain your pool in the rainy season or after periods of heavy rain, or you may pop your pool. You will essentially be continuing your regiment of testing pH, alkalinity, and hardness, applying chemicals as needed. You can probably chuck your bottles of CYA, because tablets and liquid chlorine contain stabilizer within their formulas. For a guide on pool chemistry, follow this link: How To Maintain A Swimming Pool Part 1 (Chemicals). Will residual salt affect my pool? No, the leftover salt in your pool water does not pose a danger to your pool equipment. The electrolysis created by the reaction to the salt cell is what caused most of the corrosion in your pool, not the salt itself. Without the cell, the salt will be relatively harmless. And before you fire up the keyboards talking about the corrosiveness of seawater, be aware that seawater contains 35,000 ppm salinity level, and your pool water has about 3,500 ppm tops. After you have purged so much water to lower your CYA, your pool water’s salinity level will be a fraction of the 3,500 ppm. We cover the pros and cons of various types of chlorinators in the video above. I have it cued to the section explaining the differences between the three main choices which are floating, in-line, and off-line chlorinators. For the in-line and off-line types, the biggest concern will be location and spacing. Chlorinators should be the last piece of equipment on your plumbing line, after your filter, gas heater or solar panels. So, you will need to find a spot with straight pipe that is long enough and with enough clearance above and below to install and service the chlorinator. Regular flow-through cells like the Intellichlor, AquaRite, and Pureline are long enough for an in-line chlorinator to be slotted in its place. If your equipment pad is a tight squeeze or your cell has an odd configuration like a CompuPool or Jandy AquaPure Ei, an off-line chlorinator will be the better choice. It requires a small hole to tap the plumbing line and for the return feeder line. And it can be set beside the equipment pad instead of on the pipe. Shut off the power to the control box, then unmount it. Remove the flow switch from the tee mount, plug the tee tap or remove the tee and replumb the section. Unscrew the cell from the plumbing line. If you have one of those flow through cells like the Hayward AquaRite, then those steps are simple. But if you have a CompuPool upside down U-shape or the AutoPilot manifold design, the removal of the cell and associated piping will likely require some PVC elbow grease. I believe there are links to equipment in the article. Not if you follow the steps mentioned in the article. Outside of the cost of chlorine tabs or liquid, the cost to convert is relatively nothing. I’m in the process of doing this very thing. I have fought with my pool’s chemistry for years and its constant pH drift and the resulting scale formation. No more! Whoever says a salt water pool is easier to take care of is either not well informed or is conning you. Well, I can understand frustration coming from your particular situation. But most of the thousands of pool owners we’ve talked to over the years would say salt systems are the real deal. Salt pools have a naturally higher pH, but if you are having constant pH rise issues it is a sign you are running your salt system too much without properly addressing your TA. For learners who are new to the lingo and caught between conventional chlorine / acid pools and salt chlorine generator systems, acronyms are where learners check out and stop learning out of frustration. Using an acronym like TA without initially spelling it out assumes we are as expert as the experts answering the questions. One way around this is to provide a comprehensive list of all acronyms and their meanings for the learners, then pause while some refer to the list to define the meaning, until the list has been learned by all. Don’t fall into the trap of using these abbreviations to distinguish the teacher from the student, the students will never rise to the goal the teacher is striving for. By the way, I assume you mean Total Alkalinity, but I am guessing. By no means was I using jargon to separate me from our readers. 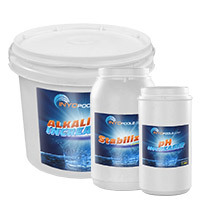 Total Alkalinity (TA) is a very common term used in this blog, especially by me. 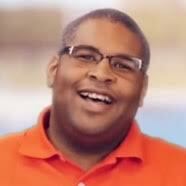 And although there are lots of beginners that find us, there are also curious experienced pool owners who have the basics down. So when I’m firing off a quick reply to someone, and I don’t want to type Total Alkalinity for the 20th time of the day, I’ll use the abbreviation because it is quicker. Especially if I can gauge by the question if the commenter is more experienced. On the flipside, if this was a formal article, I would follow the standard procedure of laying it out with the abbreviation. But seeing as this was a simple reply to a question focused purely on water chemstry, i think even a pool newcomer could narrow TA down to meaning Total Alkalinity. Also, if someone is curious about a term, they can always simply ask. I’m here to help. We put the required salt in our pool but our saltwater pump never worked to change it to the salt. Now we have a pool full of salt. How do I remove the salt to go back to regular chlorine? Thanks. 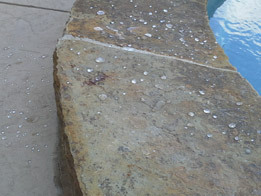 Other than draining the pool and starting with fresh water, there is no way to remove the salt. But you can just start adding chlorine to the pool. The salt will not affect the chlorine liquid or tabs used. When I decided to go back to chlorine tablets, I just unplugged the salt cell. Is that a mistake? What’s going to happen to the salt that’s still in the pool? Should I be concerned? I really don’t want to have to drain! I’m new to this & worried. Please help!!! Scale could form on the cell causing a lot of backpressure and a blockage. As I cover in the article, the salt stays in the water. The salt level will eventually lower as you backwash or drain and refill with freshwater. I agree with you Tom. I have had a Salt pool for over 13 years and it has been a headache. I have spent lots of money on Salt Cells over the years. I feel like the technology isn’t quite up to par just yet. A good example is the price you pay for the Salt Cell and the warranty that comes with it. Plus, what you save in chlorine tablets you spend in electricity (especially in the summer) to keep chlorine levels up. Even with conditioner the pump must run to create chlorine to make to the end of a sunny day. The salt system is easy on the eyes but with proper chemical monitoring I feel I can get the same benefits from normal chlorine. Chlorine Tablets here I come. Every pool is different, so there are some outliers, but the vast majority of pool owners we deal with on a daily basis prefer their salt over chlorine. I can’t speak too much on why your particular pool was difficulty with the switch, but the root could be a sizing issue. If a 20K gallon cell is put on an 18k gallon pool, you will need to run the salt system nearly full strength to properly chlorinate the pool. That kind of installation can kill a cell quickly. Regarding your pump run time point, I think that is inaccurate. If you use liquid chlorine, the pump still has to run to mix it into solution properly. 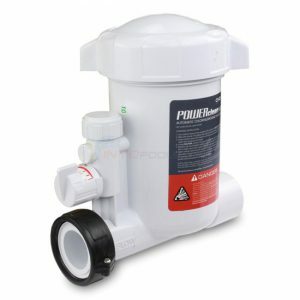 If you are using tablets, then you are still using the pump to push the water through the inline or offline chlorinator. Whichever route you take, traditional or salt, the pump is going to be used. 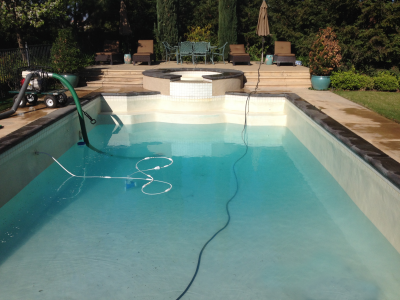 Salt does not require more of the pump if you have the system installed and set up correctly for your pool’s needs. Helpful reads. I initially liked our salt conversion after resurfacing, but I am considering going back to tablets, am torn. As one person above states, I’ve been struggling, albeit intermittently, with with my salt pool. One thing, not mentioned above, is that with a salt pool, things are a little bit more “out of sight”. Unless you check your pool EVERY SINGLE DAY, things might start to slip. I have had the cell begin to reduce or stop salt production altogether — and didn’t recognize the slippage until too late…argh. Control reset issues: control says “check cell; low salt level” — but the salt level ok – verified. My control will not reset, per the instructions provided on your site. Cell taken in and tested? Tested good. Too many variables to troubleshoot. I’m almost ready to go back to tablets lol. By the way – you guys are the best on line pool site. PSC Ep. 60: What’s the Difference Between a Start and Run Capacitor?